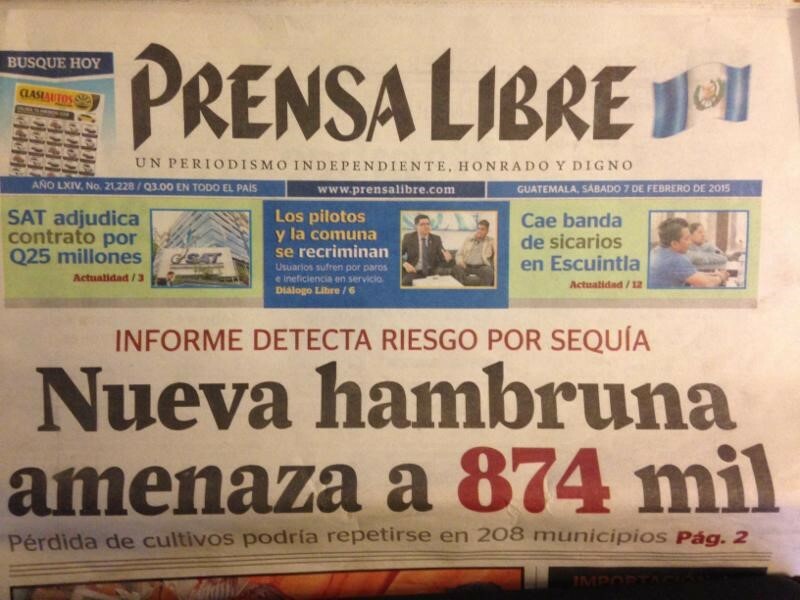 “New famine”, cries out the Guatemalan newspaper headline (La Prensa, February 7, 2015), threatening the lives of 874,000 people in 206 regions of the country. ‘Famine and hunger spreading through Guatemala, Honduras, Nicaragua and El Salvador’, reports the United Nation’s Food and Hunger Program, pulling on heart strings, opening their bank accounts for charity donations, many of which might come from the countries and consumers that help create and profit from the famine and hunger. Former general, now president Otto Perez Molina promises: “My government will not abandon those families suffering from drought”, as his government cuts back spending on health and education, increasing spending on police and military forces that provide “protection” to large-scale landowners, the mining industry, hydro-electric dam companies, etc, that control the best lands and water sources, so as to produce goods for faraway investors and consumers. produce African palm and sugar cane for food products and “green” energies like bio-diesel fuel and ethanol so that vehicles of faraway consumers will not hunger for fuel, will not be famished for endless travel and mobility. 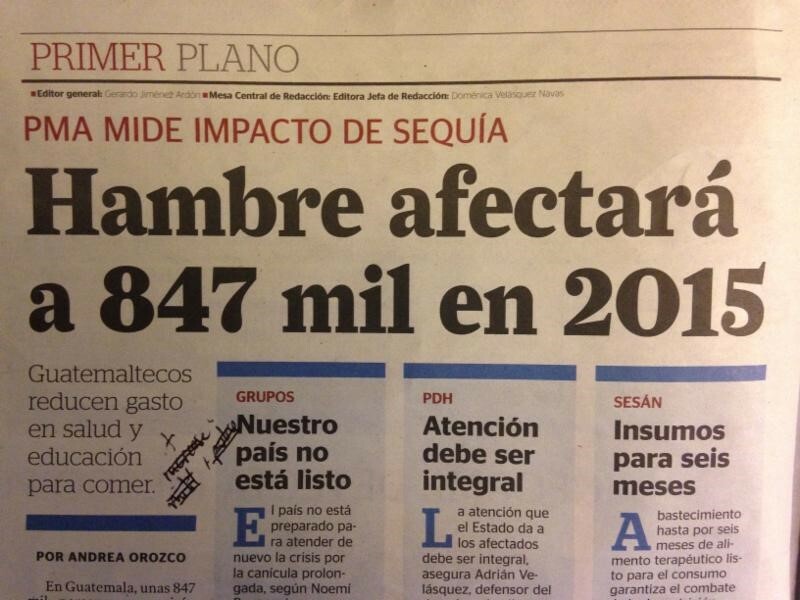 There will be no reporting about how the Guatemalan police, military and private security guards forcibly evict indigenous and campesino communities to make way for hydro-electric dams and open-pit gold, silver and nickel mining operations so that global investors (private equity firms and pension funds) will not hunger for profits. Nor will there be analysis about how the World Bank, Inter-American development Bank, governments of Canada, United States, etc, are passing more “free trade” agreements, to make more of Guatemala’s best lands and water available to more foreign companies and investors to produce more products for export to more consumers in faraway places, creating more famine and hunger in Guatemala, just over there beyond the chain-linked, armed-guarded fence, just up there on the dried out, parched lands of the steep mountain sides. The annual devastation and death caused by famine and hunger in countries like Guatemala are not a ‘crisis’ and they are not national issues. There will be no end to this predictable, logical cycle of global feast and famine if there is no significant transformation of the unjust global economic system that creates and perpetuates it.